Infinite is back! 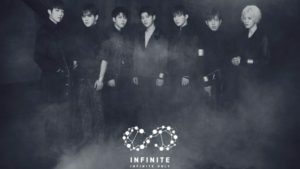 Their newest mini album, Infinite Only, marks their return after over a year since their last comeback with “Bad,” and given the short duration of that promotion cycle, it left fans with much to be desired. Fortunately, after wrapping up a successful world tour and a series of summer concerts, the infinite-dols have revamped their image to make a comeback with “The Eye,” a mid-tempo dance track composed by Bee of Rphabet. The first thing that draws attention about the song itself is how it’s same-but-different when you compare it with Infinite’s signature sound. The unique combination of Sunggyu and Woohyun’s voices still make their music as recognizable as ever, and the song’s structure is similar to “Destiny” or “Back” in the sense that it has a ballad-like opening; then the tempo speeds up building up momentum for an epic refrain. However, what differentiates this song from many of Infinite’s previous works is that the entire piece as a whole is uncharacteristically restrained – even when the chorus kicks in, there is no noticeable peak in the intensity of the music that brings the song to a climax; the part is only highlighted by the change in strength of the vocals and the more prominent beat. Even with the performance, the choreography this time around is more rhythm-focused and less dynamic than Infinite’s usual fare. Is this change then a bad thing? Not necessarily. The downside of this style is that the song doesn’t strike listeners as particularly impactful on the first listen; however, upon closer examination, it contains many interesting elements that make the piece engaging and pleasing to the ear. For one, it makes good use of the members’ unique vocal colours in the execution of the piece, as previously mentioned, through having members with the more shrill timbres sing the chorus, such as Sunggyu, L and, to some extent, Woohyun. When Woohyun hits high notes, the part is made distinguishable from the other verses, while, when the music needs be returned to a slower pace, the composition makes use of softer vocals, such as those of Sungjong and Sungyeol. I can also see the repetition in the melody of the first two lines of the chorus being the one that sticks in the head of listeners, thus serving as a potential hook. Finally, Rphabet’s music can be easily recognised by its creative use of instruments, and the motif played at the beginning of the song certainly adds a unique sound to the music. There’s also the short English samples that are interspersed here and there, but I find those rather funny-sounding more than anything. The music video is another manifestation of the idea of keeping some elements of Infinite’s style, while showing growth at the same time. As usual, much to the pain of fans, the storyline consists of Infinite – namely L this time – getting battered up, and being placed in dramatic situations in general. Yet the plot line of the MV appears more complex and meaningful this time, leaving it open to viewers’ interpretations. The most popular – and in my opinion, the most convincing one – suggests that all of the Infinite members, with the exception of L have died, leading the latter to attempt to take his own life. The video opens with L falling, presumably having jumped from a wall. However, each of the members appears to make an appearance as an emotion shown in the book on the table, aptly titled the Book of Life. Indeed, all the members attempt to be preventing L from taking his life, or as symbolically shown, going towards the light. It’s been speculated that while L is the desperation, Sunggyu represents courage, Sungyeol – fear, Sungjong – sadness, Woohyun – regret, Hoya – hate and Dongwoo – forgiveness. Ultimately, they do succeed; the lightbulb goes on at the end of the MV, suggesting the re-ignition of L’s life. Not only is the MV profound in its use of symbolism, it is also brilliant in its cinematography. The bleak colours that pervade the video reflect L’s desolation, and there is an abundance of aesthetic shots all around. In addition, more than anything, it is a heartwarming representation of the bond between the members. From the storyline itself, to the TV showing the group’s debut MV “Come Back Again,” to the cardboard box painted with their debut day June 9, 2010, the video is a long overdue tribute to the teamwork of a group that has stayed together for 6 years and counting. Infinite has been slowly evolving over the years, from their mostly Sweetune-produced hit songs, to the introduction of Rphabet-produced tracks to there discography, to the steps they have taken with their music today. While at times I’m nostalgic for Infinite’s older tracks, their newer releases continue to impress, and show their musical maturation while retaining the original concept of the group. Here’s hoping for the success of Infinite Only, and a longer promotion cycle this year!